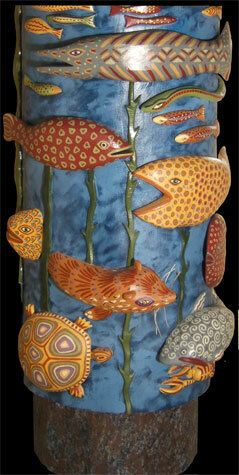 This totemic piece is installed in the childrens section of the new Coeur d'Alene Public Library. It stands nine feet tall and is divided into two sections by the check-out counter. Below the counter are the underwater creatures and above are the land and air creatures. It is made by Allen of entirely of local recycled wood and painted by Mary Dee in acrylics. The front view is at left, the back view at right.